← Does Digital Writing Matter? You know the world has changed when a baby’s first word is more likely to be iPad or cellphone over the more common introductory words of mama or daddy, crazy right? The society we now live in, no longer resembles the society our parents once knew. Babies no longer reach for rattles instead they amaze us with their astounding ability to work a cellular device before they even learn how to talk or walk. The digitally smart baby is only the beginning of the impact of the digitized era. Think about the last time you read an article or a novel? Now, think of the platform that you chose to access those texts. Personally, if you are like me you access these forms of text digitally. This could be reading the New York Times online, reading your favorite novel through iBook or simply using academic online libraries to find a source for your paper. No matter what it is you are doing, you are somehow using a form of technology to achieve your goal. Technology, however has its negative and positive implications. Some view the takeover of technology as a negative issue, for instance the authors Vivek Wadhwa and Alex Salkever discuss their feelings of angst towards technology in their book The Driver in The Driverless Car: How our Technology Choices Will Create the Future. They argue that “Increasingly pervasive data networks and connected devices are enabling rapid communication and processing of information, ushering in unprecedented shift—in everything from biology, energy, and media to politics, food, and transportation that are redefining our future. Naturally we’re uneasy; we should be” (xi). They believe that the increase and evolution of technology has taken over our ability to have proper control over our lives. Despite their concern about the risk of the future of technology the authors both acknowledge the benefits of the future of technology and are actually excited about the prospects of technologies continuous evolution. One of the particular benefits of technology they discuss is the prospect of the enhancement of education. The authors see the future of technology advancing with artificial intelligence, a one-on-one interaction with your very own personal avatar. However, I want to discuss the current way we have already begun to integrate technology with education. For us as students’ technology has become the most prominent way we access and utilize information especially. Typically, we are accessing the digital world as a means of being social. Social media sites have become the key connection for us to keep in touch with our college friends, keep abreast of pop culture or check out what our favorite celebrities are doing. On the other hand, using technology for academic purposes has also become widespread. This can be seen through the medium of digital writing. If we ask the President what digital writing was, he would probably pull up a list of his infamous tweets on American domestic policy and foreign policy and say here it is. Digital writing the ability to say the important stuff in only 140 characters, name a leader of a free world who could give you a better example. While Trump would not be wrong to consider his “masterful tweets” pieces of digital writing art, they are in fact some form of digital writing. For the purpose of this blog post’s though will focus on more academic sources to explain digital writing and its usefulness. In the article Digital Writing Uprising: Third-Order Thinking in The Digital Humanities the author Sean Morris talks about digital writing as a rebellion against the norm because digital writing has aspects that it does not share with written word. That aspect is what Morris refers to as communal writing, for him and other scholars digital writing is a shared experience with a group of individuals. “As our writing practices become more and more digital, we discover that immense collaboration is possible and we create meaningful networks using social media tools that help us control that collaboration, monitor it and make it purposeful.” When we are writing digitally we are not writing alone or for ourselves. We know that once your writing hits the digital world that many people can contribute their opinion whether negative or positive to your writing. This can then affect how you choose to write your next article. This point also relates to the main points in Jen Rajchel’s article Consider the Audience. Rajchel argues that one of the most difficult parts of web writing is the audience. When we write our digital pieces of work, we are writing it with the people who are going to read it in mind. Rajchel says “we manage the circulation through various social platforms and code-switch for several interested parties.” In order to keep your audience interested you have to switch up the way in which you engage with them through your writing. This could be through the tone you use in your writing or making your writing more multimodal so that readers can stay engaged. Digital writing has been a transformative experience. I think that many students would also appreciate the ability to catch a break from writing mundane academic papers and try their hand at a new form of writing; digital writing that is. As young adults we are always on social media and have been introduced to technology from a young age, but we only really utilize technology in this aspect. In Shelbie Witte’s article That’s Online Writing, Not Boring School Writing”: Writing with Blogs and the Talkback Project she introduces a short anecdote about a student who was not doing well in her English classes, and during parent-teacher conference found out from the perplexed parents that the student would go home and spend hours at night writing short stories and poems. The student’s explanation was that “it was online writing, not boring school writing”. This eight-grade student is voicing what some of us college students might be afraid to convey. Witte who could not understand why her student could not write a short passage in her journal, but go home and write an essay decided to do her research and switch up her curriculum. She introduced her students to the world of blogging as a different form of academic writing and the rest was history. Witte believed that “by combing writing with online technology, teachers can provide opportunities for students and future educators to develop their digital fluency while also strengthening their traditional literacy skills.” With her introduction of a blog project in the classrooms she proved her argument. Digital writing can be a tool to engage students in the classroom and help us improve with our academic writing. This past summer, right before I came back to school my Mac laptop just completely stopped working with no interference from me. The first thing I did when I discovered this was cry my eyes out, panicking about what I would use at school. When I tell you, I search up every ask forum, article on computers and those how-to YouTube videos to revive my computer, I am not exaggerating. In fact, it might be an understatement. I think that I blame these sites for my inability to fix my computer, they used super technical terms that I could not define even when presented with the definition. The writers of these articles, blog posts and forums did not completely stop to think about the average audience who would be tuning in for help with their computers. That is why when I think about what classes on digital writing offers students, the first thing that comes to mind is the opportunity to expand your writing skills for a wider audience. Typically, when you are a student in college or in high school the papers you write are for one person, you always know your audience is going to be your teacher or professor. This is not the case for the digital world. In the digital world you can have a various group of people who might be interested in what you are speaking of, the only time you truly know who your audience is, is when you get the opportunity to engage with them. This could be through comments or response blog posts. When you are writing in the digital space you must tailor the things you post, your blog layout, and other aspects that make up your blog, to appeal to your audience. As a student here at Dickinson, I am used to writing academic papers for all my classes. I think that digital writing can help improve the way I write my academic papers because it allows you to find your voice. When you are a writing your blog post, you rely on your thoughts and opinions. You may draw on other people’s thoughts but you still end up internalizing those thoughts and analyzing it in your own voice. I think that when I am writing academic papers I get too focused on trying to make this paper sound as intellectual as possible and lose a bit of my actual voice when writing. When I am writing blog posts you get to find a balance, because even though you are not specifically targeting an academic audience, you still want your blog to make sense and have a voice of authority. Here at Dickinson, I am a Law & Policy major. A big part of my writing for Law & Policy has been having to analyzing cases and then think about my opinion of those cases, analyzing them through that lens. This part of my writing for my major feels similar to what we have doing with the blog project. Instead of analyzing cases we have chosen a topic of our choice to analyze and then write about what we think about them. For my blog project I have chosen to write about my senior year. I chose this subject because everyone has different opinions on your senior year of college is supposed to go and I decided that maybe my experience differed from some but others could possibly relate and a communal community we could share the senior year experience. For this project I highlight the most important aspects of senior year and then use my personal voice to express how I’m feeling about the pressure of employment search, my nervousness towards graduation or my sadness concerning leaving my friends. Blogging has given me a new outlook on writing, because when you get to write from your perspective it becomes less of hassle and more of something to look forward to. According to the article From Written to Digital: The New Literacy by Phillip Ventimiglia and George Pullman the authors discuss how important integrating digital writing into education is because of future employment benefits. They say that “students can be more successful after graduation if they are digitally literate—having learned how to identify and create digital solutions, adapt to new tools, discover more effective and efficient way of doing things in their fields.” After graduation I want to gain work experience before I start applying to law school or graduate school. One of the career fields that I am most interested in, is a career path in public relations. I believe that taking this class on digital writing would be beneficial to a public relations job because you might have to write an article in magazine on person, or a press release. I think this class has been beneficial for those skills because they will not be like academic papers, and generally would be digital writing pieces. Another important public relation skill to have would be to have creativity and I think that is one of the key things that I have learned so far in this digital writing class. Having to come up with interesting and appealing blog ideas and blog posts focuses on building up your creativity skills. I see myself using digital writing in this career field a lot, and possibly in other future careers as well. 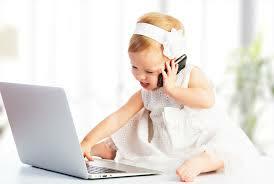 However, I’ll probably never have as good as grasp on technology as this baby MTS Internet Baby. Rajchel, Jen. “Consider the Audience.” Edited by Jack Dougherty and Tennyson O’Donnell, Web Writing Why and How for Liberal Arts Teaching and Learning Consider the Audience Comments, University of Michigan Press, 4 Mar. 2015, epress.trincoll.edu/webwriting/chapter/rajchel/. Morris, Sean. “Digital Writing Uprising: Third-Order Thinking in the Digital Humanities.” Hybrid Pedagogy, 8 Oct. 2012, www.digitalpedagogylab.com/hybridped/digital-writing-uprising-third-order-thinking-in-the-digital-humanities/. Ventimiglia , Phillip , and George Pullman. “From Written to Digital: The New Literacy.” Why it Matter to Higher Education: Educause Review, 7 Mar. 2016, er.educause.edu/articles/2016/3/from-written-to-digital-the-new-literacy. Wadhwa, Vivek, and Alex Salkever. The driver in the driverless car: how our technology choices will create the future. BK Berrett-Koehler Publishers, Inc., 2017. Witte, Shelbie. ““That’s Online Writing, Not Boring School Writing”: Writing With Blogs and the Talkback Project.” Journal of Adolescent & Adult Literacy, vol. 51, no. 2, Oct. 2007, pp. 92–96., doi:10.1598/jaal.51.2.1.